One series here at The UC was entitled "Top 10 Reasons to Get Excited for the Olympics," and on that countdown there was a post called the first medalists....meaning countries that get to receive their first Olympic medals. 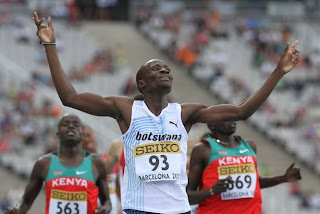 During the Men's 800m, I saw Nigel Amos warming up, and I was like...."hmm I've been watching the small African nation of Botswana in the Olympics since 1996, they have always sent runners to the Olympics, and they always come in last, or sometimes even in fouth...which must hurt more than last in the Olympics." Nigel Amos proved me wrong, and he took Silver in the Men's 800m, the first medal ever for the nation of Botswana. Congratulations Nigel and Congratulations Botswana. Which African country will win their first medal next?